I finally made some time today to give my new toy a tune-up, new air filter, new spark plug, and new fuel filter (I still need to change the oil, and inflate one of the not so inflated tires). 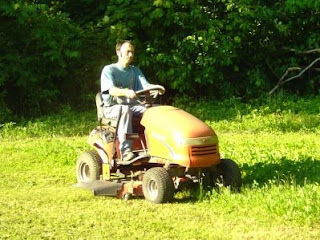 After that I installed the mower deck and took it for a ride. It's still running a little choppy, but I'll get that fixed, too, sometime. Now, this is the country, folks, and as E! once said: You ain't nothing out here without heavy equipment! And people like to take their equipment for a ride. 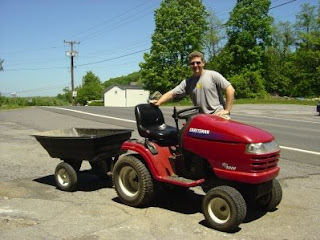 Our neighbor Jody stopped by to pick up the trailer cart, so he can collect rocks around his orchard. I admit, his tractor looks more shiny (I can wash mine, too), has more power (maybe I should turbo-charge the engine, all the cool kids do it these days), and it has a cup holder. A CUP HOLDER!!! Aaaaaaaaaaaaaaaaaargh!!! Me wants it!!! Aside from riding around on the tractor I finished pouring the slab for the A/C compressor, and reinstalled the fixtures in the ADA bathroom. E! was busy in the kitchen, no not cooking, but skim coating two walls, sanding and painting them (did I tell you she is the painter in our household? ).